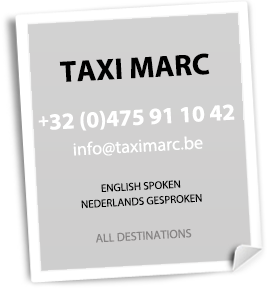 By sending us an email to info@taximarc.be. You can use the contact document at your right to make your reservations. To be sure that your reservation will be taken into account, please make it minimum 24hrs in advance. You will receive an email with the confirmation of your order. In case you do not receive a confirmation from us within half a day following your order, please contact us by phone on the number +32 (0)475/91.10.42.